Mérida is the Capital city of the Extremadura Region of Spain, one of the country’s least visited and least populated (about 3%) regions. The summers are hot and dry. The winters are long and wet. 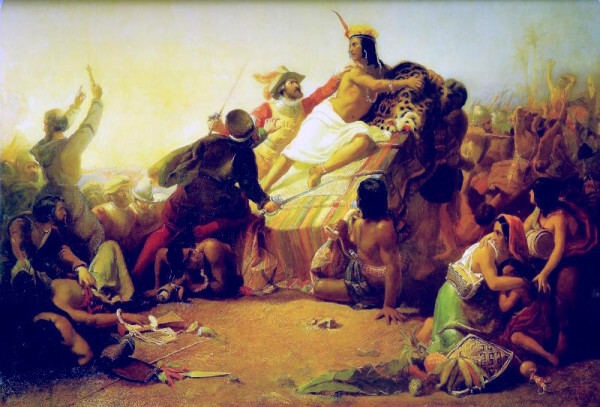 The Extremadura is famous for the Spanish Conquistadors, Hernàn Cortès and Francisco Pizarro, the two conquerors who wiped out the Incan Empire and stole their gold. The Extremadura is also famous for the black Iberian pigs and their prized cured ‘jamon ibérico bellota’. The pigs live on a diet of wild acorns (bellota). They are cared for and then cured into the best ham in the world. 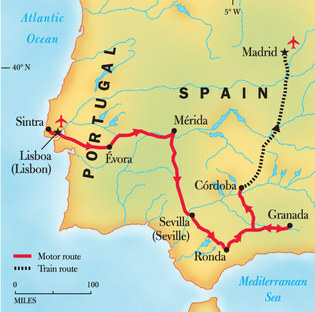 Mérida is about 215 miles southwest of Madrid, 120 miles north of Seville and 180 miles east of Lisbon (Portugal). It’s a great location but not much a big draw to modern tourists and travelers. 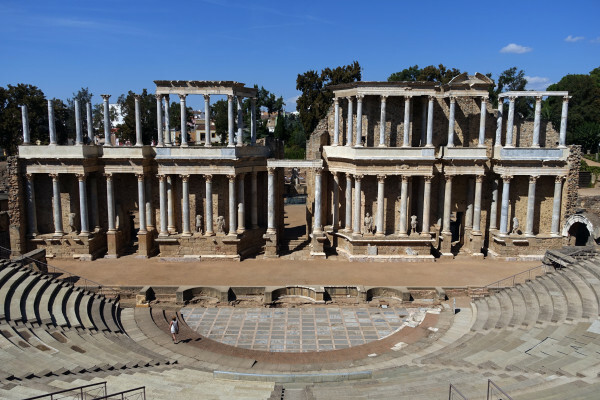 However, things were much different between the 1st and 4th centuries when Mérida was known as the Colonia Emerita Augusta, a colony founded for the retired soldiers who fought for the Emperor Augustus in 25 BC. 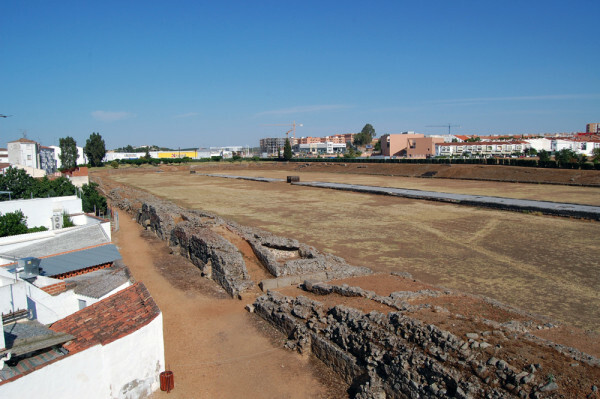 Emerita Augusta enjoyed a convenient location along the Rio Guadiana, a major commerce link to the other great Roman cities of Spain and Portugal, Olisipo (Lisbon), Toletum (Toledo), Caesaragusta (Zaragoza), Corduba (Cordoba) and Hispalis (Seville) to name a few. In 17 BC, Emerita Augusta became the Roman capital city of the newly created (27 BC) region of Lusitania, now known as Portugal. By the 4th century, Emerita Augusta became one of the seats of the civil administration of the Hispanic Peninsula. By the 5th century it was a Visigoth stronghold and one of the earliest Christian communities in Spain. 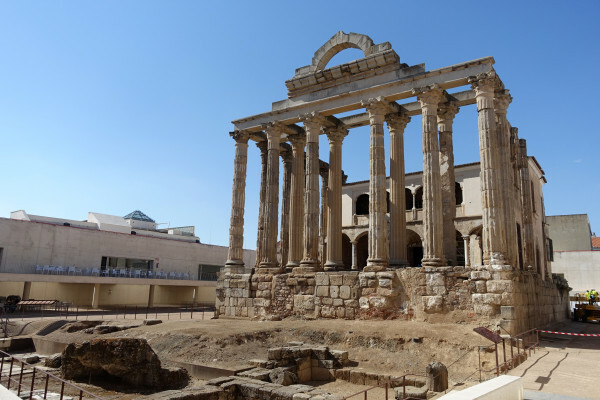 In the 9th century, the city (and the rest of Spain) was occupied by the Moors and after the Christian Re-conquest of Spain in the 15th century, Merida was on the way to becoming an historical footnote. The Emperor Augustus awarded the land to the 10th Gemina, the 5th Alaude Legions, soldiers who fought in the Cantabrian and Austurian Wars. Parcels of land were often given to retiring soldiers and colonies of Rome sprung up all over the Empire. The Cantabrian and Austurian Wars actually took place in the northwest coast of Spain, still known as Cantabria and Austurias. They were essential ports in the Roman Hispanic territory. The skilled warriors of the Cantabri and Astures were a thorn in the side of Roman expansion since the days of Hannibal and the 2nd Punic War of the early 3rd century BC. Actually, the Cantabrian and Austurian war didn’t end till 19 BC, 6 years after the Colony of Emeritus Augustus was founded. 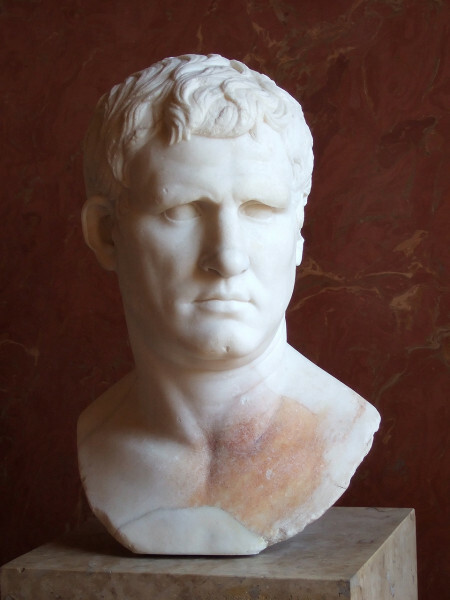 In 19 BC, Marcus Vipsanius Agrippa was brought to Hispania to end the war. Agrippa led the victory of Augustus over Mark Antony and Cleopatra in the Battle of Actium in 31 BC. The Cantabrian War was his second full command. 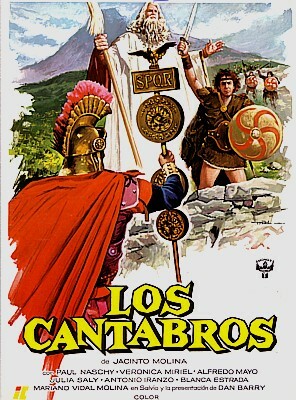 The Roman Legions were well disciplined, well trained and totally outnumbered their enemy with 8 legions and over 52,000 troops, but the Cantabrian and Austurian warriors were highly skilled Guerilla fighters, attacking in small ambush parties and retreating back into the protections of the Cantabrian mountain range. The Romans had no idea how to fight this kind of war. They were exhausted and demoralized. Agrippa restored discipline, rebuilt the confidence of the army and led them to victory. 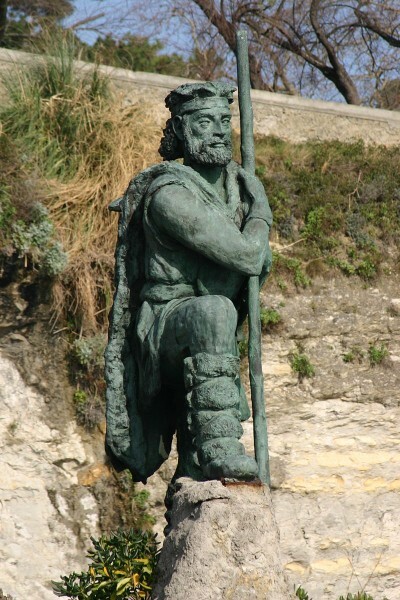 There is a statue of Corocotta in Santander, the Capital city of modern Cantabria. Corocotta was the leader of the Cantabrian rebels. 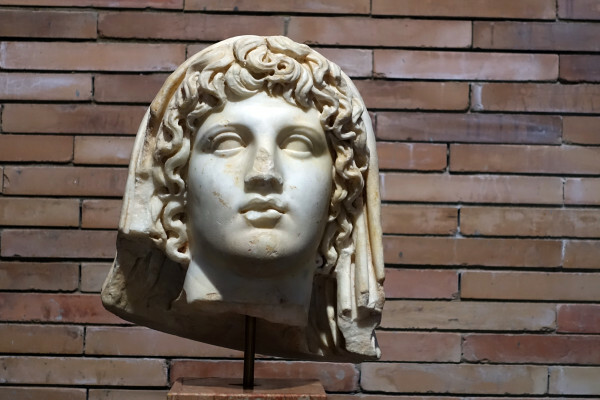 According to the Roman historian, Cassius Dio, when Augustus offered a million sesterces reward for his capture , Corocotta presented himself to collect the reward. Augustus was so impressed, he let him go free with a larger sum. However, the rebellion continued for a while longer. When the war was over, Marcus Agrippa became Colonia Emeritus Augusta’s greatest patron. Marcus Vipsanius Agrippa was the brilliant General, City-Planner, builder, philanthropist, son-in-law and best friend of the Emperor Augustus, father-in-law to the soon to be Emperor Tiberius and grandfather of the Emperors Caligula and Nero. Agrippa was one of the most remarkable people of the 1st century BC. Even though we know very little about him, he definitely made his mark all over the Roman Empire. Although Augustus is credited with rebuilding Rome into the classical city we still see today, it was actually Agrippa who facilitated most of the building, even paying for much of it from his own pocket. He is currently remembered for the Pantheon in Rome, although the structure was built more to 100 years after his death. Agrippa did, in fact, built a Pantheon Temple in Rome but it was destroyed by fire. The Pantheon we see today is dedicated to Agrippa but built by the Emperor Hadrian in 118 AD. Agrippa’s building projects weren’t limited to Rome. Although many of them have been reduced to an outline in the dirt or a few large stones, some are still in very good condition. 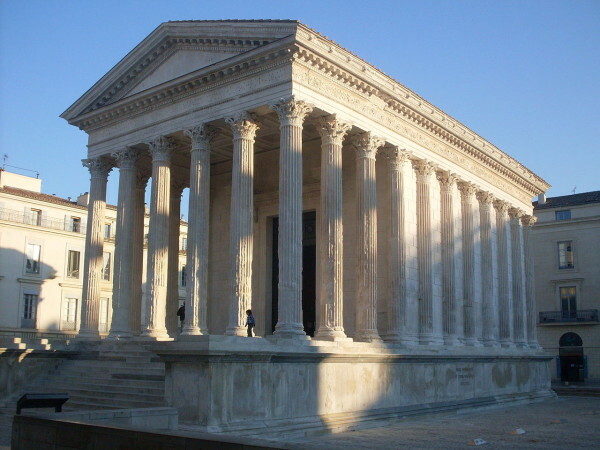 The Maison Carée in Nimes, France could be the best preserved Roman temple in existence. It was built by Agrippa in 16 BC and dedicated to his two sons, Gaius and Lucius, who would have succeeded Augustus if they survived. Another of the best examples of Agrippa’s legacy is here in Mérida. 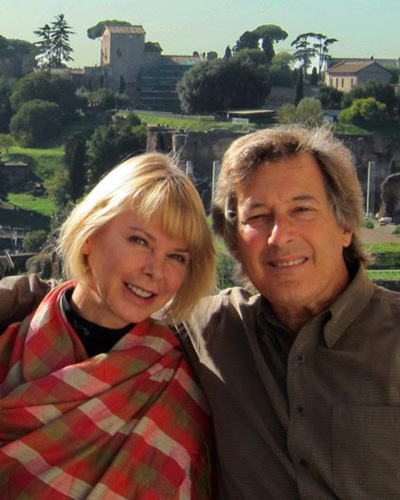 These days it’s known as the Teatro Romano, the largest standing Roman theater in Europe. It’s been rebuilt and added to over the years but the Agrippa foundations from 16 BC are all still there, right down to the dedication inscription on the façade of the theater. Marcus Agrippa, son of Lucius, three times council, in the third year of his tribunal powers. When it was completed, the theater (supposedly) held close to 6,000 people. The upstage façade we see today was actually built in 105 AD during the reign of Trajan (the first of the Spanish Emperors). The theater was updated through the time of the Emperor Constantine in 335, possibly even after, but by the 7th century it fell into decay. Most of what is here today is the reconstruction that began in 1910, completed in 1964. It is still in use to stage classical plays in June and July. The red granite base of the stage façade holds two tiers of Corinthian columns. 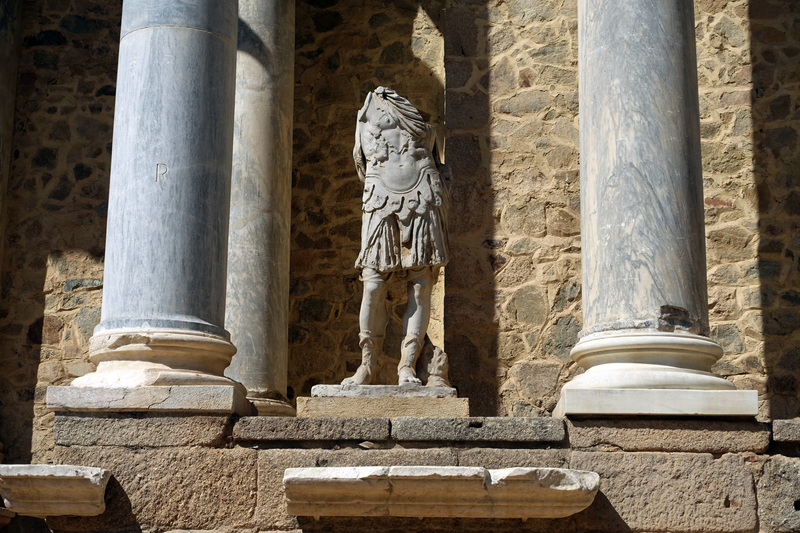 Between the columns once stood statues of politicians, soldiers and deities. Most of them are gone but a few statues have been reinstated to give the effect of what it once was. 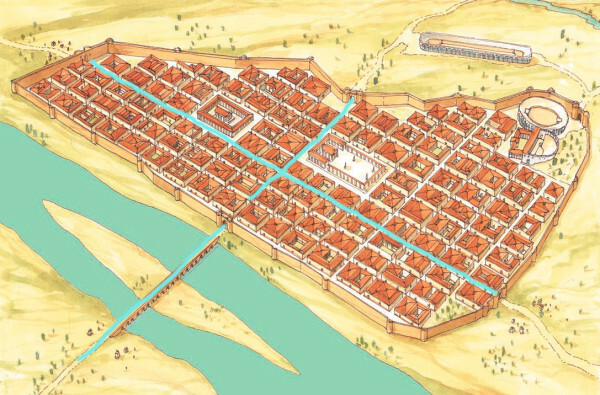 The ancient 1st century city of Emeritus Augusta is built around the standard Roman city plan based on 2 avenues; the Cardo going north to south and the Decumanus from west to east. In Emerita Augusta, the Cardo travels from the remains of Trajan’s Arch (most likely built around 16 AD at the time of the Emperor Tiberius) to the no longer existing Arch of Cimbron, named for the Roman Republic victory of the Cimbrian Wars in the 2nd century BC. The Decumanus travels from the Roman bridge to the town gate. The Decumanus always ran to the Roman Military encampment, usually on the other side of a Roman Bridge. The armed Militia was not allowed in the city limits, unless of course, the city was under siege. 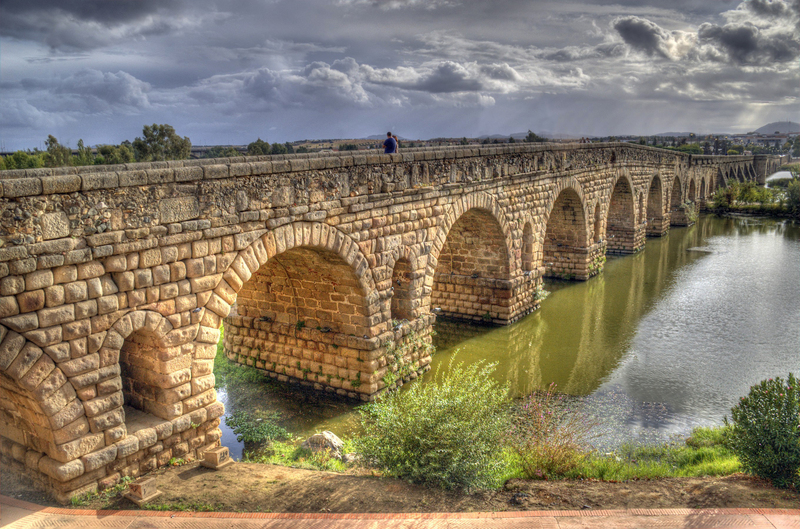 The Roman Bridge (Puente Romana) of Mérida is the longest standing 1st century Roman bridge in the world with 57 arches. It once had 64 arches but over time, wars and flooding they’ve reduced down to 57. Sitting next to the Roman Theater in kind of a 1st century sports complex is the 1st century Amphitheater, which predates the Theater by around 10 years. According to some historians, the amphitheater had a capacity of 30,000 people although that number might be (very) over-exaggerated. The original stadium probably held around 6,000 but by the 8th century the renovation increased the capacity more in the line of 15,000. 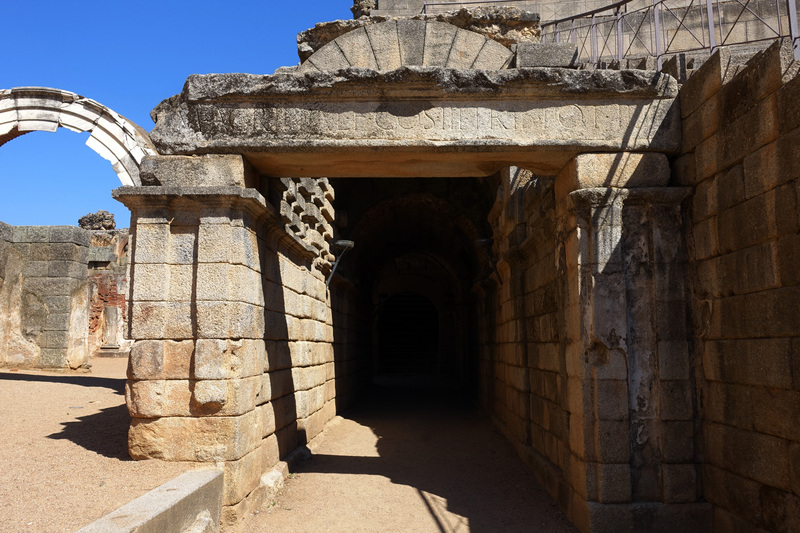 It’s a very complete Roman Amphitheater with arcade passages, VIP seating and underground staging areas. The Museo Nacional de Arte Romano, opened in 1986, is the largest Roman artifact museum in Spain claiming over 30,000 artifacts of mosaics, sculpture, pottery, glassware, coins and bronze. The museum is connected to the amphitheater by an underground tunnel. This is one of the best museums of Roman art and artifact and you should definitely give yourself a couple of hours to see it. It is built on the scale of a Roman basilica with a grand main hall and galleries showcasing the treasures. You can buy deal a single ‘Entrada conjunta’ for 12€ that is good for the amphitheater, the Roman theater and the Museo Nacional de Arte Romano. The (inappropriately named) Temple of Diana (about a 10 minutes walk from the Amphitheater) sits inside what was once the Ancient Forum. For some reason, the archeologists who dug out the Temple associated it with Diana. The name stuck. Archeology is often like this. However, more recent research tends to believe the Temple was dedicated to the cult of Augustus. Eventually, the Temple was incorporated into a 16th century house. What a great house it must have been at the time, but thankfully for us, most of the house has been demolished and the Temple is completely visible. The head of the once large statue of the ‘Genius’, the protective deity of the Senate was discovered very close to the Temple of Diana. It’s now on display in the Museum along with some other really wonderful pieces of antiquity. 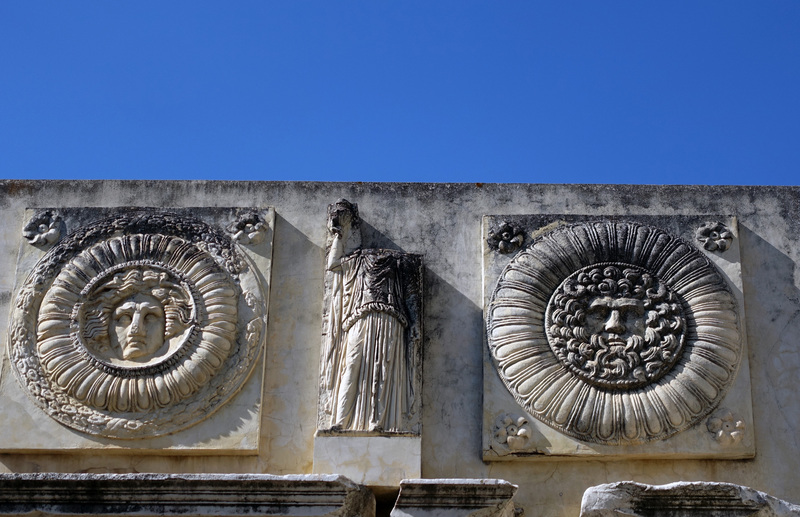 The Forum was once surrounded by a portico decorated with alternating heads of the Medusa and Jupiter Ammon, the same kind of décor found in the forum of Augustus in Rome. After-all, this was an Augustian city. There is a piece of the ancient portico erected in the middle of once was the Roman Forum but it was most likely a reconstruction. 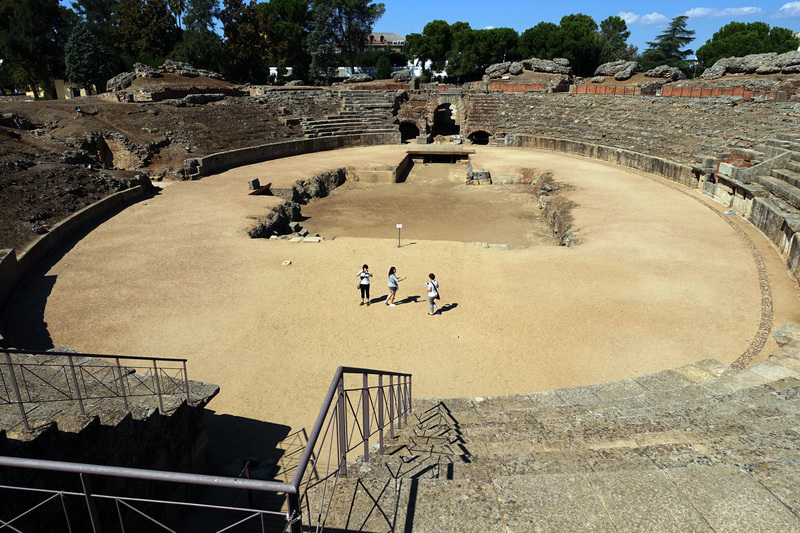 The Circo Romano, or Circus Maximus of Mérida (a 15 minute walk from the Amphitheater), was modeled after the Circus Maximus in Rome although a smaller version that once held close to 20,000. The Circus Maximus in Rome held over 150,000. The Circus (Circo) was constructed during the time of Tiberius but the major work was finished under Domitian at the end of the 1st century and Trajan in the beginning of the 2nd century. It was renovated all the way through the 4th century. It’s now just an idea of what it might have been. The Temple dedicated to Mars, (15 minute walk from the Amphitheater) was incorporated into the ‘Hornita de Santa Eulalia’ (oven of St Eulalia) chapel. It became the pilgrimage site for the cult of Saint Eulalia. The Frieze ‘MARTI SACRUM/VETTILLA PACULI’ (dedicated to Mars by Vettilla, the wife of Paculus) from the 2nd century still exists in a cartouche. Eulalia was martyred by being burned to death during the reign of Trajan Decius (249-251), an Emperor who demanded all citizens make sacrifices to Emperor and the Empire. All those who refused were tortured and executed. These sacrificial offerings didn’t really do much good. Trajan Decius only lasted 2 years. He was killed in Dacia (Romania and the Balkans) which is kind of ironic, since his namesake, Trajan, was the conqueror of the Dacia in 106. 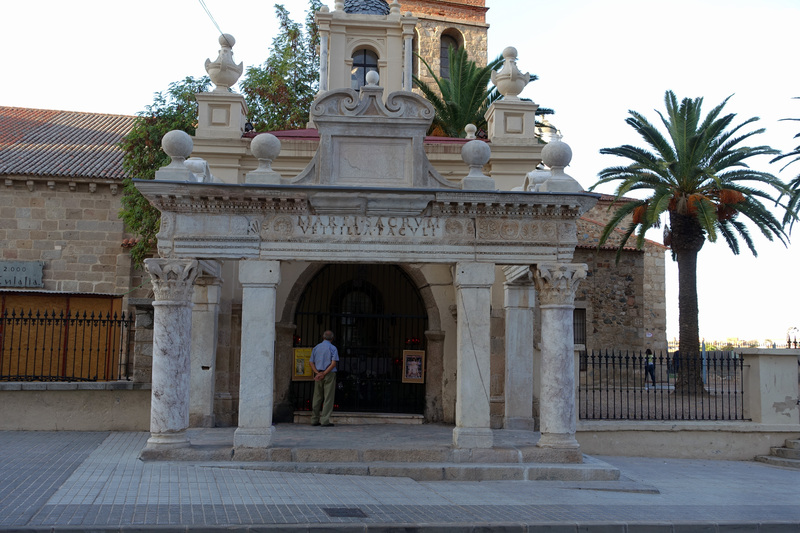 The confusion associated with Santa Eulalia goes on way beyond when she lived and died. The Eulalia of Merida was martyred at age 13 after being subjected to torture. There is another Santa Eulalia from Barcelona who was also martyred at 13 after being subjected to torture. And then, there is the Santa Julia (which sounds a lot like Santa Eulalia) who was tortured and martyred at age 13 in the year 304. Either they are all the same saint with various backstories or there is a lot of confusion going on here. 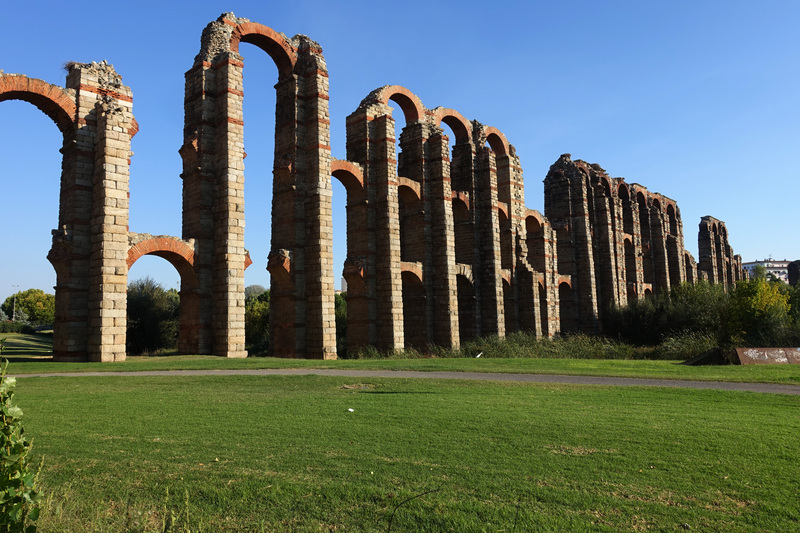 In ancient times, there were 3 aqueducts carrying water to Emerita Augusta. The third one has disappeared. The ‘Los Milagros’ (Miracles) Aqueduct is the most famous. It’s a fantastic stretch of 38 triple and double arches erected in layers of red brick and cut stone. Some of them soar up over 82’ into the skyline. There is a theory that after the Moors conquered Merida in the 8th century they copied the brick and stone style in the building of the great Mosque (La Mezquita) in Cordoba. 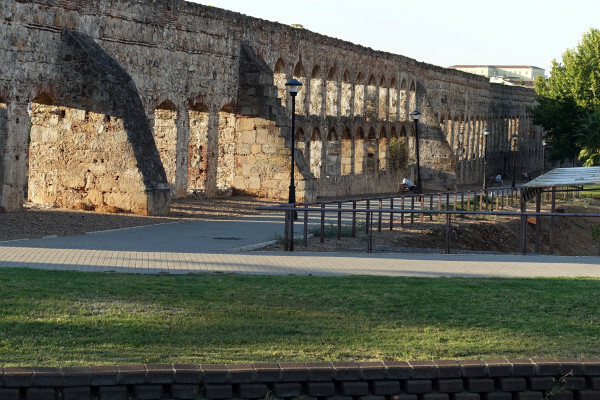 The San Làzaro Aqueduct is mostly underground but there is still a good stretch of arches near the Circo Romano. 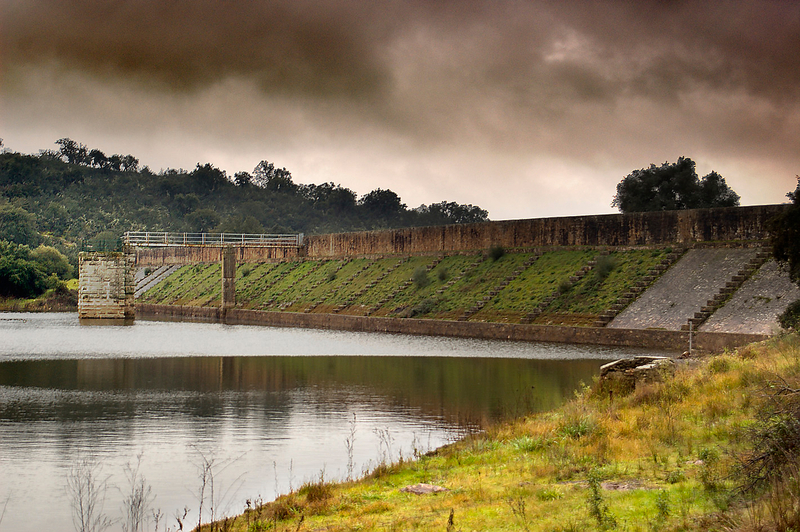 It was named for the Chapel dedicated to San Làzaro that was destroyed during the restoration of the ancient Aqueduct. However, if you have a car, you might be interested in a drive about 25km northeast of Merida to the Cornalvo Reservoir. The 1st century Roman Cornalvo and Proserpina gravity dams that fed the aqueducts of Emerita Augusta are still there and still functioning. Merida is a good (full) day visit. If you have time, you can also include the Museo Arqueologico de Arte Visigodo (6th and 7th century Visigoth artifacts), the Casa del Mitreo, a 1st century villa with some great floor mosaics a 15 minute walk from the amphitheater, the necropolis and Visigoth foundations below the Basilica de Santa Eulalia (behind the temple dedicated to mars) and the 9th century, Moorish Alcazaba that took a roman building and enlarged it into the Moorish fortress. The roman cistern in the basement is original. One more historical note to add about Emerita Augusta. An early Governor of Colonia Emerita Augusta was the future Roman Emperor Otho, who ruled Rome for 3 months between January and April 69 AD. Marcus Salvius Otho was from a very wealthy Roman family, a wild, extravagant rich boy and close friend of the Emperor Nero. However, when Nero met his wife Poppaea Sabina, the friendship changed. Nero issued Otho to Emerita Augusta and took Poppaea Sabina for his own wife. He later killed her while she was supposedly pregnant with their second child. Nero died in 68 AD, a mercy killing by his personal servant. Upon Nero’s death, Servius Sulpicius Galba became the next Emperor. He lasted 7 months till he was assassinated and replaced by Otho. Otho barely lasted 3 months. 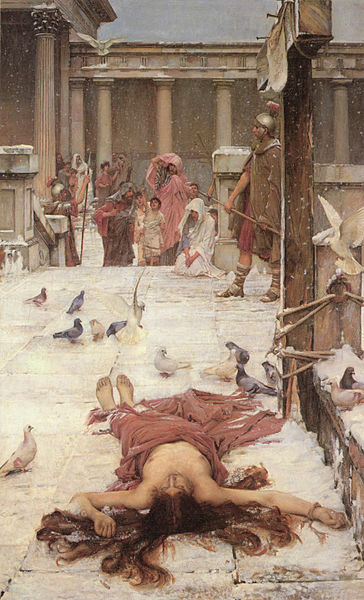 After his loss to Aulus Vitellius in northern Italy (at Bedriacum, about 35km from modern Cremona), he committed suicide. 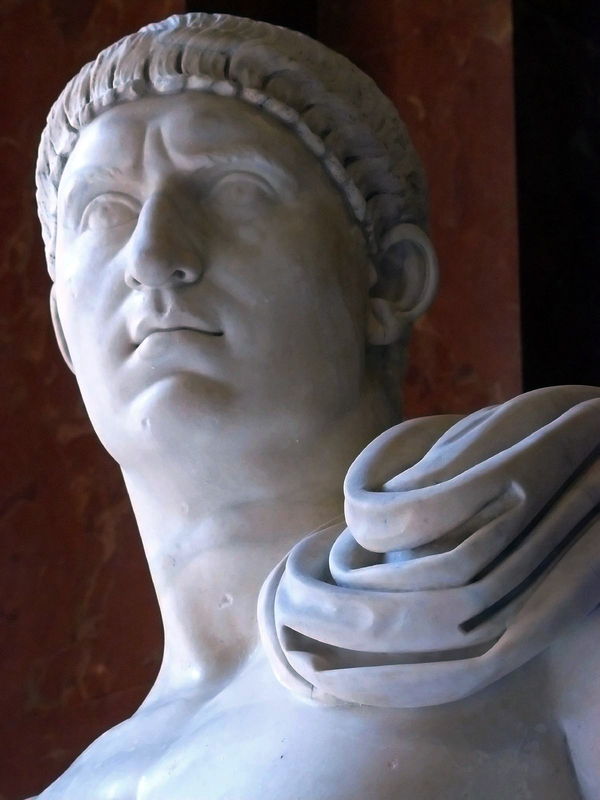 Vitellius lasted barely 8 months when he was defeated by Titus Flavius Vespasian, the commander of the eastern Provinces. 69 AD is known as the Year of Four Emperors. By the time it was over, Vespasian had started his own Flavian dynasty that lasted 30 years.